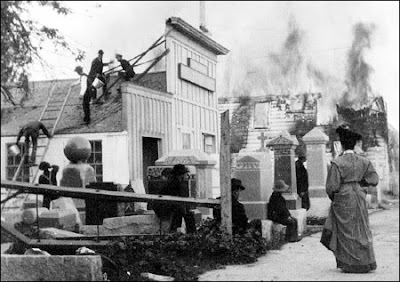 Even while the town was furiously shaking, fires were starting on Fourth Street. On the corner of B Street in the Shea building, Mrs. Martin ran into the hallway during the quake and saw flames visible through a glass door. She smashed the glass only to find a roaring fire underway, presumed fed by a broken gas line. Smoke soon billowed from the building. Frank Muther jumped out of bed on the first shock. Grabbing his clothes, he dressed as he ran as fast as he could to downtown, two blocks away. 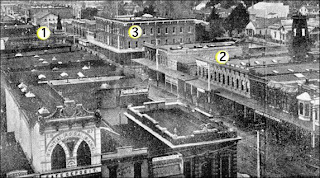 As Santa Rosa's Fire Chief, Muther had a reputation for being first at the scene, but he was also owner of cigar factory and store on Fourth Street and he headed there first. Like the rest of the block, his business (near the current location of "Tex Wasabi's") was in a two-story wood building that was badly damaged and nearly unrecognizable from the loss of its ornamental cast iron and brick façade, yet it was still standing. From the vantage point of his roof, he gazed upon his ruined town as dawn was breaking. The top story of the courthouse had crumbled, taking with it the great two-story-high cupola that capped the building, along with the life-size statue of the goddess of justice that stood sentinel upon the dome's peak. On Fourth St. between Mendocino and D Street, everything was gone. All those fine brick buildings were so much dust -- the old Athenaeum, Santa Rosa's opera house that could seat 2,500, the town's post office, the long row of little stores, even the grand new Masonic Temple that wasn't quite finished. 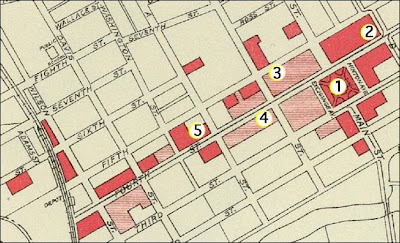 The Fifth Street side of the block was lost, too, which included the two largest livery stables. Probably most of the horses quartered there were dead, but that wouldn't be the greatest tragedy in that block; there were rented rooms above some of the stores, so there also would be people buried there in the rubble. Muther made a command decision that it would be better to let the fires burn themselves out in the collapsed brick structures, and the quicker they burned up, the less risk they posed to the parts of town that might still be saved. He decided to concentrate fire fighting efforts on trying to save wood frame buildings, like his own. But fires were springing up everywhere. Flames were coming from two stores near him, and his entire block was already doomed. Santa Rosa's Fifth Street firehouse was right across the alley from Muther's store, and the alley was filled with materials ready to burn. Muther saw that flames were just starting to reach behind the stores to the sheds and piles of wooden boxes that were stacked as high as a man could reach. The fire was spreading down the alley fast, towards the firehouse. Now just a few minutes past dawn, people were streaming into downtown. Some were storekeepers wanting to protect their shops or at least salvage their wares; others came to help, and some certainly to gawk. Seventeen year-old Obert Pedersen arrived on his bike and was stunned to see "the whole thing was down." People who lived in the rooming houses above the stores were trapped in the wreckage and screaming for help. Pedersen helped rescue several who were pinned on their mattress, trapped by a falling ceiling or a collapsed headboard of their own bed. He also helped carry corpses to a makeshift morgue setup on someone's front yard. Luther Burbank was among the early to arrive at the scene. "Electric wires were sputtering," he recalled in 1911, "gun powder and various chemicals were exploding; the gas had sprung a leak at the gas works and other places had caught fire; gunpowder, chemicals, cartridges, and shells were exploding, and fires were breaking out in a dozen different places...with fires advancing unchecked, people were crawling out through the rubbish, bleeding and half dressed, covered from head to foot with lime and sickening dust." On the western end of Fourth Street, Mr. Duffy lay trapped in the ruins of the New Saint Rose Hotel. His quick wits had saved his life; instead of rushing down a collapsing hotel stairway, he threw his body next to the substantial mahogany dresser in his room, which protected him as the three-story building pancaked. It was five hours before rescuers were able to pinpoint his location, despite his shouts for help. He was lucky; after he was pulled out, he told newspapers that he saw arms waving from amid the debris, but there was so much other noise on the street that their screams could not be heard. "Just then, as I looked, the flames swept over them and cruelly finished the work begun by the earthquake. The sight sickened me and I turned away." Duffy was presumably describing the horrific death of Miles Peerman, a former Santa Rosa constable. A religious magazine published a detailed account: " [He] was held down by wreckage in the Carither's building [today the site of the Zap building at the corner of 5th and B] in plain view of the people. They did their best to dig him out, but the heat of the raging fire became so intense that they could no longer stay by him. He then begged them to shoot him. So he was burned to death fully conscious of his approaching fate." Fire chief Muther also led his two crews in rescuing victims - one trapped man later described the gratitude he felt as cool water began trickling through the debris as the flames were approaching his position - and the firemen were lucky that their horses and both steam engine rigs at the Fifth St. firehouse were unharmed. Not so fortunate was the situation they faced. The fire hydrants were all but useless; the city's cast iron pipe system was already notorious for poor water pressure due to leaks (see "Santa Rosa's Water System Wars,") and now there were cracks from the earthquake and underground explosions in the gas mains - nearly a year later they would uncover a water pipe bent like an archer's bow. The desperate firemen resorted to sucking what water they could from Santa Rosa Creek. And then there were the streets themselves, which were almost impassible. Fourth Street, 75 feet wide, was reduced to a footpath down the middle because of all the debris from buildings on both sides. At times, the firemen had to unhitch the horses and pull the rigs by hand. The fires burned for at least two days. One of the best accounts of this day came from Jessie Loranger, who came downtown to watch the destruction of Santa Rosa with her family. "The sight that met our eyes was terrible. Fire was raging in a half a dozen different places. Men were digging and chopping in the ruins of what had been hotels and lodging houses trying to get out those buried beneath the falling timbers and debris. As we went down B Street at Mrs. D. N. Canther's, the body of a man lay on a door covered with a sheet on the lawn near the gate. Women were crowded everywhere crying and everyone near the fire had household goods packed to go as soon as the flames got nearer. Although men worked with all their might the water pipes were broken and a very small amount of water was available. Chas. [her husband], in helping with the hose, got his eyelashes burned off. The heat was overpowering and all that saved the town was the absence of wind." Like so many others, 8 year-old Ernest Spekter and his family stayed outdoors that night and was unable to sleep. They lived in Occidental, which was also badly damaged by the quake, his family's home knocked off the foundation. As darkness fell they joined neighbors on "Indian Hill" (now Sugarloaf Summit), the highest point in West County. From there they could see the lights and smoke of San Francisco burning to the south and Santa Rosa burning to the east. It was a night of a terrible red sky. SOURCES: Frank Muther testimony in Fountain v. Connecticut Fire Insurance Co. and Loomis v. Connecticut Fire Insurance Co., The Pacific reporter, Volume 117 pp 630-648 (1911) and quoted in California Supreme Court Decisions, Volume 158, pg 766-744 (1911). Obert Pedersen: San Francisco Chronicle Earthquake 75 year anniversary (1981). 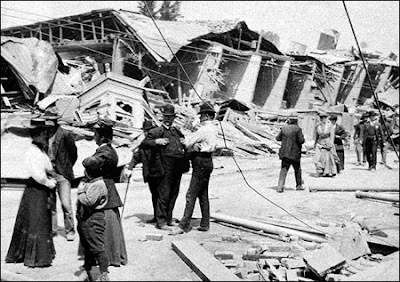 The San Francisco Earthquake Horror (1906). Burbank recollection from Nov. 14, 1911 excerpted in Sonoma Historian, 2006 #1. Peerman death from Monroe H. Alexander, "The Earthquake in Santa Rosa," California Christian Advocate, Dec. 27, 1906. History of Sonoma County, Tom Gregory (1911). Jessie Loranger letter quoted in The Great Earthquake and Firestorms of 1906. Spekter description from Press Democrat July 5, 1976.